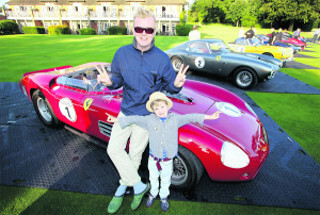 Friday 4th April 2014 has been declared a national Classic Car day by the well know TV and radio presenter Chris Evans. Chris he is not only famous for his radio and TV achievements but also famous for his love of cars particularly the classic car variety and he has quite a collection. 1973 Ferrari 365 GTB/4 Daytona Berlinetta. The day is designed to not only be a celebration of our love for Classic Cars, but to also help raise money for the BBC Children In Need Appeal. How it works is that we get our beloved classic cars out for the commute to work. We phone around all our friends and take them to work in our Classic and get them to donate to Children In Need for the pleasure and privilege of riding in our car. Their are no specific rules. If you consider your car to be a classic then that’s good enough. Let’s hope that Friday the 4th turns out to be a spectacular day for classic cars and also for the Children In Need campaign. If you have an open top classic you will be pleased to know that most of the UK is going to keep dry for the most part, according to the BBC weather forecast. Their are some patches of rain predicted to appear in England during the rush hour period, with most of the rain in the far north of England and Scotland. However the temperatures are set to rise with temperatures of 14, 16 in central England and a high of 18 degrees predicted for the London area. We have experienced a really poor day for air quality on the 3rd April. The forecast is that it will get better on Friday 4th and significantly better over the weekend which is good news. From Very Cheap Car Insurance, we wish all of the British classic car drivers who will be supporting the BBC Children In Need appeal, a fantastic classic car day!